Hundreds of die-hard iPhone fans lined up outside the Queen Street Mall’s Optus and Telstra stores for this week’s launch of Apple’s iPhone 4. Harsh criticism of poor reception from reviewers did not stop customers from queueing outside the stores from midday on Wednesday. 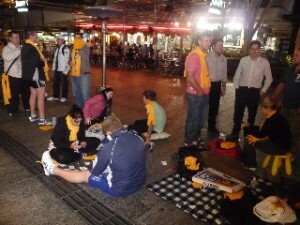 By 11.30pm the 400 Optus queuers were being pampered with free three-minute massages, coffee, food, Optus scarves, Optus beanies, stools and entertainment from 97.3 radio DJ Terry Hansen, a balloon artist, a human banana and three human monkeys. But Optus staff remained tight-lipped on whether they had enough phones for the increasing crowd. At the head of the Optus line university students Michael Smart and Andy Ley were counting the minutes until the doors opened. “We’ve never done this before, but I bet there’s an iPhone app for it,” Mr Ley said. Telstra’s Indooroopilly Shoppingtown, Westfield Chermside and Queens Plaza also opened their doors at midnight. But it was an 8am start for Apple’s Chermside store and a 9am start for most other phone retailers. At $859 (16GB) and $999 (32GB), outright, the new smartphone boasts a 5 mega-pixel camera, improved screen, faster processer and, until 30 September, a free case for customers.